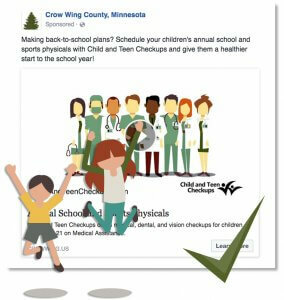 Our client, Crow Wing County, recently received statewide “Best Practices” marketing recognition from the Minnesota Department of Health for our Child and Teen Checkups (C&TC) Facebook ad campaign. But it didn’t start with an award-winning idea . . . In asking “why” and discussing the needs of the campaign further, it became clear that even though numerous other counties were doing it, movie theater advertising wasn’t the best route to reach the specific C&TC audience. In this case, we recommended that C&TC use social media to speak to their audience. We created a Facebook ad campaign using motion graphics videos and illustrated ads to grab the attention of parents whose children could benefit from the program. The campaign gave parents easy access (from their smartphones!) to the healthcare services available to their children, and resulted in heightened awareness and increased website traffic for the program—not to mention the recognition from the Minnesota Department of Health. Contact us for more information on how we can use powerful communication to help you reach and impact your target audience.